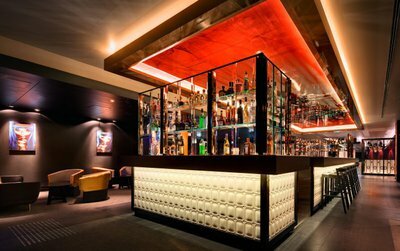 Having spent many years living in New York, I often reminisce about the opulence and chic that New York bars and hotels are renowned for - so I was delighted when I recently discovered Sokyo Lounge at The Darling. From the moment you peek into Sokyo Lounge through the oriental lattice from the foyer of The Darling, the style and sophistication oozes and you almost feel like you've been transferred to a different world. I took a seat at the bar in the centre of the Lounge and watched the bartenders as they weaved their magic, mixing drinks in tall icy glasses, twirling and shaking tumblers, creating cocktails of all different shades and colours to order. This is definitely one of the best things about going to a cocktail bar - watching the bartenders in action. Sokyo Lounge boasts a comprehensive cocktail list featuring many exquisite Japanese ingredients and flavours. My favourite was the Yamamomo Sour, a concoction of Choya umeshu plum wine and sake, shaken in the typical sour cocktail way with lemon juice and egg white, and garnished with the rare Japanese mountain peach, yamamomo. I also tried their Japanese spin on the mojito, the Shiso-jito, a mix of the traditional notes of Havana Club Blanco rum, lime and soda, twisted with kalamansi lime and shiso leaf sorbet. I would happily return for either cocktail (again and again). In the background the resident DJ played some funky beats to set the mood. Unlike most bars, the music was the perfect volume, loud enough to drown out the conversations around you and get your foot tapping, but soft enough that you could still get lost in your own conversation with the person beside you. My seat at the bar was also in the perfect position for some great people watching as glamourous guests of The Darling gathered in the foyer and wandered through the Sokyo Lounge. Off to the right, diners were lining up ready for a night of culinary indulgence at the Sokyo Restaurant. Sokyo Lounge is on my list of favourite bars and I'm sure it will be one of yours too.